Definition at line 411 of file f0/rcc.h. Definition at line 53 of file f0/rcc.h. Definition at line 244 of file f0/rcc.h. Definition at line 248 of file f0/rcc.h. Definition at line 247 of file f0/rcc.h. Definition at line 249 of file f0/rcc.h. Definition at line 245 of file f0/rcc.h. Definition at line 243 of file f0/rcc.h. Definition at line 242 of file f0/rcc.h. Definition at line 241 of file f0/rcc.h. Definition at line 240 of file f0/rcc.h. Definition at line 239 of file f0/rcc.h. Definition at line 238 of file f0/rcc.h. Definition at line 246 of file f0/rcc.h. Definition at line 237 of file f0/rcc.h. Definition at line 58 of file f0/rcc.h. Definition at line 333 of file f0/rcc.h. Definition at line 332 of file f0/rcc.h. Definition at line 331 of file f0/rcc.h. Definition at line 330 of file f0/rcc.h. Definition at line 329 of file f0/rcc.h. Definition at line 328 of file f0/rcc.h. Definition at line 327 of file f0/rcc.h. Definition at line 55 of file f0/rcc.h. Definition at line 272 of file f0/rcc.h. Definition at line 268 of file f0/rcc.h. Definition at line 271 of file f0/rcc.h. Definition at line 269 of file f0/rcc.h. Definition at line 275 of file f0/rcc.h. Definition at line 274 of file f0/rcc.h. Definition at line 270 of file f0/rcc.h. Definition at line 280 of file f0/rcc.h. Definition at line 282 of file f0/rcc.h. Definition at line 286 of file f0/rcc.h. Definition at line 285 of file f0/rcc.h. Definition at line 284 of file f0/rcc.h. Definition at line 283 of file f0/rcc.h. Definition at line 279 of file f0/rcc.h. Definition at line 278 of file f0/rcc.h. Definition at line 277 of file f0/rcc.h. Definition at line 276 of file f0/rcc.h. Definition at line 273 of file f0/rcc.h. Definition at line 281 of file f0/rcc.h. Definition at line 52 of file f0/rcc.h. Definition at line 219 of file f0/rcc.h. Definition at line 215 of file f0/rcc.h. Definition at line 218 of file f0/rcc.h. Definition at line 216 of file f0/rcc.h. Definition at line 222 of file f0/rcc.h. Definition at line 221 of file f0/rcc.h. Definition at line 217 of file f0/rcc.h. Definition at line 227 of file f0/rcc.h. Definition at line 229 of file f0/rcc.h. Definition at line 233 of file f0/rcc.h. Definition at line 232 of file f0/rcc.h. Definition at line 231 of file f0/rcc.h. Definition at line 230 of file f0/rcc.h. Definition at line 226 of file f0/rcc.h. Definition at line 225 of file f0/rcc.h. Definition at line 224 of file f0/rcc.h. Definition at line 223 of file f0/rcc.h. Definition at line 220 of file f0/rcc.h. Definition at line 228 of file f0/rcc.h. F0 doens't realllly have apb2, but it has a bunch of things enabled via the "APB2" enable register. Definition at line 405 of file f0/rcc.h. Definition at line 54 of file f0/rcc.h. Definition at line 260 of file f0/rcc.h. Definition at line 253 of file f0/rcc.h. Definition at line 258 of file f0/rcc.h. Definition at line 264 of file f0/rcc.h. Definition at line 256 of file f0/rcc.h. Definition at line 255 of file f0/rcc.h. Definition at line 254 of file f0/rcc.h. Definition at line 259 of file f0/rcc.h. Definition at line 257 of file f0/rcc.h. Definition at line 263 of file f0/rcc.h. Definition at line 262 of file f0/rcc.h. Definition at line 261 of file f0/rcc.h. Definition at line 51 of file f0/rcc.h. Definition at line 207 of file f0/rcc.h. Definition at line 200 of file f0/rcc.h. Definition at line 205 of file f0/rcc.h. Definition at line 211 of file f0/rcc.h. Definition at line 203 of file f0/rcc.h. Definition at line 202 of file f0/rcc.h. Definition at line 201 of file f0/rcc.h. Definition at line 206 of file f0/rcc.h. Definition at line 204 of file f0/rcc.h. Definition at line 210 of file f0/rcc.h. Definition at line 209 of file f0/rcc.h. Definition at line 208 of file f0/rcc.h. Definition at line 56 of file f0/rcc.h. 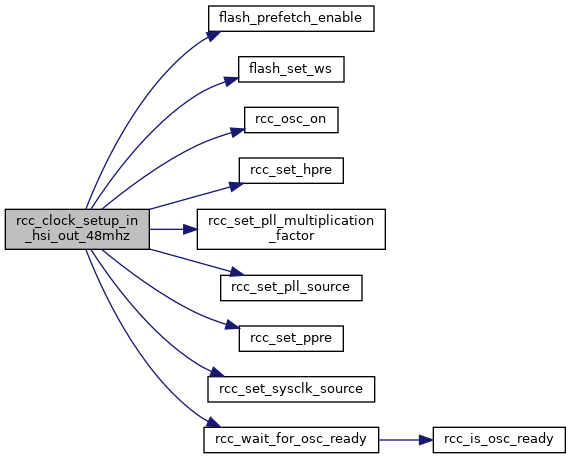 Referenced by rcc_disable_rtc_clock(), rcc_enable_rtc_clock(), rcc_is_osc_ready(), rcc_osc_bypass_disable(), rcc_osc_bypass_enable(), rcc_osc_off(), rcc_osc_on(), and rcc_set_rtc_clock_source(). Definition at line 290 of file f0/rcc.h. Definition at line 304 of file f0/rcc.h. Referenced by rcc_osc_bypass_disable(), and rcc_osc_bypass_enable(). Definition at line 299 of file f0/rcc.h. Definition at line 303 of file f0/rcc.h. Definition at line 300 of file f0/rcc.h. Definition at line 302 of file f0/rcc.h. Definition at line 301 of file f0/rcc.h. Definition at line 298 of file f0/rcc.h. Definition at line 306 of file f0/rcc.h. Referenced by rcc_osc_off(), and rcc_osc_on(). Definition at line 305 of file f0/rcc.h. Definition at line 291 of file f0/rcc.h. Referenced by rcc_disable_rtc_clock(), and rcc_enable_rtc_clock(). Definition at line 293 of file f0/rcc.h. Definition at line 297 of file f0/rcc.h. Definition at line 295 of file f0/rcc.h. Definition at line 296 of file f0/rcc.h. Definition at line 294 of file f0/rcc.h. Definition at line 292 of file f0/rcc.h. Definition at line 49 of file f0/rcc.h. Referenced by rcc_set_hpre(), rcc_set_mco(), rcc_set_pll_multiplication_factor(), rcc_set_pll_source(), rcc_set_pllxtpre(), rcc_set_ppre(), rcc_set_sysclk_source(), and rcc_system_clock_source(). Definition at line 59 of file f0/rcc.h. Definition at line 338 of file f0/rcc.h. Definition at line 60 of file f0/rcc.h. Referenced by rcc_get_i2c_clocks(), rcc_set_i2c_clock_hsi(), rcc_set_i2c_clock_sysclk(), rcc_set_usbclk_source(), and rcc_usb_clock_source(). Definition at line 369 of file f0/rcc.h. Definition at line 371 of file f0/rcc.h. Definition at line 372 of file f0/rcc.h. Referenced by rcc_get_i2c_clocks(), rcc_set_i2c_clock_hsi(), and rcc_set_i2c_clock_sysclk(). Definition at line 375 of file f0/rcc.h. Definition at line 379 of file f0/rcc.h. Definition at line 378 of file f0/rcc.h. Definition at line 376 of file f0/rcc.h. Definition at line 374 of file f0/rcc.h. Definition at line 377 of file f0/rcc.h. Definition at line 363 of file f0/rcc.h. Definition at line 367 of file f0/rcc.h. Definition at line 366 of file f0/rcc.h. Definition at line 364 of file f0/rcc.h. Definition at line 362 of file f0/rcc.h. Definition at line 365 of file f0/rcc.h. Definition at line 370 of file f0/rcc.h. Referenced by rcc_set_usbclk_source(), and rcc_usb_clock_source(). Definition at line 136 of file f0/rcc.h. Definition at line 147 of file f0/rcc.h. Definition at line 154 of file f0/rcc.h. Definition at line 152 of file f0/rcc.h. Definition at line 149 of file f0/rcc.h. Definition at line 155 of file f0/rcc.h. Definition at line 150 of file f0/rcc.h. Definition at line 156 of file f0/rcc.h. Definition at line 153 of file f0/rcc.h. Definition at line 151 of file f0/rcc.h. Definition at line 148 of file f0/rcc.h. 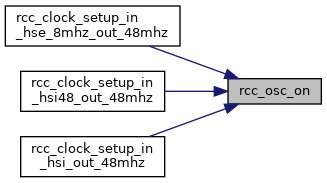 Referenced by rcc_clock_setup_in_hse_8mhz_out_48mhz(), rcc_clock_setup_in_hsi48_out_48mhz(), and rcc_clock_setup_in_hsi_out_48mhz(). Definition at line 146 of file f0/rcc.h. Definition at line 105 of file f0/rcc.h. Definition at line 104 of file f0/rcc.h. Definition at line 100 of file f0/rcc.h. Definition at line 107 of file f0/rcc.h. Definition at line 102 of file f0/rcc.h. Definition at line 101 of file f0/rcc.h. Definition at line 98 of file f0/rcc.h. Definition at line 99 of file f0/rcc.h. Definition at line 106 of file f0/rcc.h. Definition at line 97 of file f0/rcc.h. Definition at line 103 of file f0/rcc.h. Definition at line 87 of file f0/rcc.h. Definition at line 88 of file f0/rcc.h. Definition at line 95 of file f0/rcc.h. Definition at line 92 of file f0/rcc.h. Definition at line 89 of file f0/rcc.h. Definition at line 93 of file f0/rcc.h. Definition at line 90 of file f0/rcc.h. Definition at line 94 of file f0/rcc.h. Definition at line 91 of file f0/rcc.h. Definition at line 86 of file f0/rcc.h. Definition at line 110 of file f0/rcc.h. Definition at line 119 of file f0/rcc.h. Definition at line 120 of file f0/rcc.h. Definition at line 121 of file f0/rcc.h. Definition at line 122 of file f0/rcc.h. Definition at line 123 of file f0/rcc.h. Definition at line 124 of file f0/rcc.h. Definition at line 125 of file f0/rcc.h. Definition at line 111 of file f0/rcc.h. Definition at line 112 of file f0/rcc.h. Definition at line 113 of file f0/rcc.h. Definition at line 114 of file f0/rcc.h. Definition at line 115 of file f0/rcc.h. Definition at line 116 of file f0/rcc.h. Definition at line 117 of file f0/rcc.h. Definition at line 118 of file f0/rcc.h. Definition at line 109 of file f0/rcc.h. Definition at line 84 of file f0/rcc.h. Definition at line 131 of file f0/rcc.h. Definition at line 135 of file f0/rcc.h. Definition at line 133 of file f0/rcc.h. Definition at line 132 of file f0/rcc.h. Definition at line 127 of file f0/rcc.h. Definition at line 128 of file f0/rcc.h. Definition at line 129 of file f0/rcc.h. Definition at line 139 of file f0/rcc.h. Definition at line 144 of file f0/rcc.h. Definition at line 141 of file f0/rcc.h. Definition at line 142 of file f0/rcc.h. Definition at line 143 of file f0/rcc.h. Definition at line 140 of file f0/rcc.h. Definition at line 138 of file f0/rcc.h. Definition at line 166 of file f0/rcc.h. Definition at line 168 of file f0/rcc.h. Definition at line 167 of file f0/rcc.h. Definition at line 170 of file f0/rcc.h. Definition at line 169 of file f0/rcc.h. Definition at line 165 of file f0/rcc.h. Definition at line 159 of file f0/rcc.h. Definition at line 161 of file f0/rcc.h. Definition at line 160 of file f0/rcc.h. Definition at line 163 of file f0/rcc.h. Definition at line 162 of file f0/rcc.h. Definition at line 158 of file f0/rcc.h. Definition at line 50 of file f0/rcc.h. Referenced by rcc_css_int_clear(), rcc_css_int_flag(), rcc_osc_ready_int_clear(), rcc_osc_ready_int_disable(), rcc_osc_ready_int_enable(), and rcc_osc_ready_int_flag(). Definition at line 174 of file f0/rcc.h. Definition at line 189 of file f0/rcc.h. Definition at line 178 of file f0/rcc.h. Referenced by rcc_osc_ready_int_clear(), and rcc_osc_ready_int_disable(). Definition at line 193 of file f0/rcc.h. Definition at line 185 of file f0/rcc.h. Definition at line 176 of file f0/rcc.h. Definition at line 191 of file f0/rcc.h. Definition at line 183 of file f0/rcc.h. Definition at line 175 of file f0/rcc.h. Definition at line 190 of file f0/rcc.h. Definition at line 182 of file f0/rcc.h. Definition at line 179 of file f0/rcc.h. Definition at line 194 of file f0/rcc.h. Definition at line 186 of file f0/rcc.h. Definition at line 180 of file f0/rcc.h. Definition at line 195 of file f0/rcc.h. Definition at line 187 of file f0/rcc.h. Definition at line 181 of file f0/rcc.h. Definition at line 196 of file f0/rcc.h. Definition at line 188 of file f0/rcc.h. Definition at line 177 of file f0/rcc.h. Definition at line 192 of file f0/rcc.h. Definition at line 184 of file f0/rcc.h. Definition at line 48 of file f0/rcc.h. Referenced by rcc_css_disable(), rcc_css_enable(), rcc_is_osc_ready(), rcc_osc_bypass_disable(), rcc_osc_bypass_enable(), rcc_osc_off(), and rcc_osc_on(). Definition at line 61 of file f0/rcc.h. Referenced by rcc_is_osc_ready(), rcc_osc_off(), and rcc_osc_on(). Definition at line 388 of file f0/rcc.h. Definition at line 387 of file f0/rcc.h. Definition at line 391 of file f0/rcc.h. Definition at line 393 of file f0/rcc.h. Definition at line 392 of file f0/rcc.h. Definition at line 390 of file f0/rcc.h. Definition at line 389 of file f0/rcc.h. Definition at line 384 of file f0/rcc.h. Definition at line 383 of file f0/rcc.h. Definition at line 386 of file f0/rcc.h. Definition at line 385 of file f0/rcc.h. Definition at line 71 of file f0/rcc.h. Referenced by rcc_css_disable(), and rcc_css_enable(). Definition at line 72 of file f0/rcc.h. Definition at line 74 of file f0/rcc.h. Definition at line 73 of file f0/rcc.h. Definition at line 76 of file f0/rcc.h. Definition at line 75 of file f0/rcc.h. Definition at line 80 of file f0/rcc.h. Definition at line 79 of file f0/rcc.h. Definition at line 78 of file f0/rcc.h. Definition at line 77 of file f0/rcc.h. Definition at line 70 of file f0/rcc.h. Definition at line 69 of file f0/rcc.h. Definition at line 57 of file f0/rcc.h. Referenced by rcc_is_osc_ready(), rcc_osc_bypass_disable(), rcc_osc_bypass_enable(), rcc_osc_off(), and rcc_osc_on(). Definition at line 312 of file f0/rcc.h. Definition at line 310 of file f0/rcc.h. Definition at line 323 of file f0/rcc.h. Definition at line 322 of file f0/rcc.h. Definition at line 316 of file f0/rcc.h. Definition at line 315 of file f0/rcc.h. Definition at line 314 of file f0/rcc.h. Definition at line 318 of file f0/rcc.h. Definition at line 317 of file f0/rcc.h. Definition at line 313 of file f0/rcc.h. Definition at line 321 of file f0/rcc.h. Definition at line 311 of file f0/rcc.h. Definition at line 407 of file f0/rcc.h. Definition at line 413 of file f0/rcc.h. Definition at line 471 of file f0/rcc.h. Set System Clock PLL at 48MHz from HSE at 8MHz. Definition at line 557 of file rcc.c. References FLASH_ACR_LATENCY_024_048MHZ, flash_prefetch_enable(), flash_set_ws(), rcc_ahb_frequency, rcc_apb1_frequency, RCC_CFGR_HPRE_NODIV, RCC_CFGR_PLLMUL_MUL6, RCC_CFGR_PLLSRC_HSE_CLK, RCC_CFGR_PLLXTPRE_HSE_CLK, RCC_CFGR_PPRE_NODIV, RCC_HSE, rcc_osc_on(), RCC_PLL, rcc_set_hpre(), rcc_set_pll_multiplication_factor(), rcc_set_pll_source(), rcc_set_pllxtpre(), rcc_set_ppre(), rcc_set_sysclk_source(), and rcc_wait_for_osc_ready(). Set System Clock HSI48 at 48MHz. Definition at line 612 of file rcc.c. References FLASH_ACR_LATENCY_024_048MHZ, flash_prefetch_enable(), flash_set_ws(), rcc_ahb_frequency, rcc_apb1_frequency, RCC_CFGR_HPRE_NODIV, RCC_CFGR_PPRE_NODIV, RCC_HSI48, rcc_osc_on(), rcc_set_hpre(), rcc_set_ppre(), rcc_set_sysclk_source(), and rcc_wait_for_osc_ready(). Set System Clock PLL at 48MHz from HSI. Definition at line 585 of file rcc.c. References FLASH_ACR_LATENCY_024_048MHZ, flash_prefetch_enable(), flash_set_ws(), rcc_ahb_frequency, rcc_apb1_frequency, RCC_CFGR_HPRE_NODIV, RCC_CFGR_PLLMUL_MUL12, RCC_CFGR_PLLSRC_HSI_CLK_DIV2, RCC_CFGR_PPRE_NODIV, RCC_HSI, rcc_osc_on(), RCC_PLL, rcc_set_hpre(), rcc_set_pll_multiplication_factor(), rcc_set_pll_source(), rcc_set_ppre(), rcc_set_sysclk_source(), and rcc_wait_for_osc_ready(). RCC Disable the Clock Security System. Definition at line 322 of file rcc.c. RCC Enable the Clock Security System. Definition at line 313 of file rcc.c. RCC Clear the Clock Security System Interrupt Flag. Definition at line 190 of file rcc.c. RCC Read the Clock Security System Interrupt Flag. int. Boolean value for flag set. Definition at line 201 of file rcc.c. RCC Disable the RTC clock. Definition at line 397 of file rcc.c. 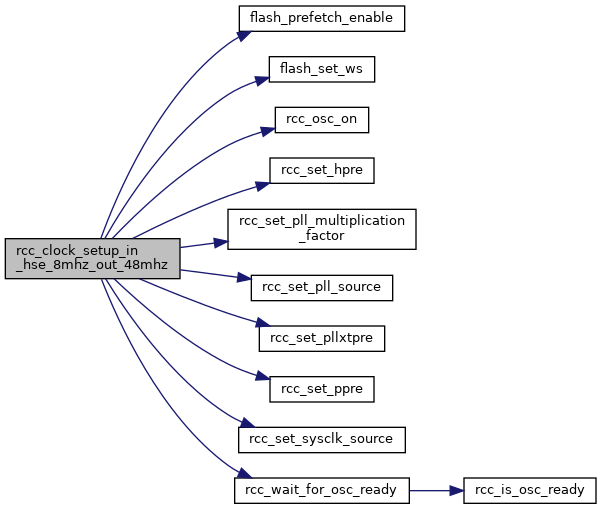 RCC Enable the RTC clock. Definition at line 387 of file rcc.c. Definition at line 538 of file rcc.c. Is the given oscillator ready? true if the hardware indicates the oscillator is ready. Definition at line 206 of file rcc.c. References RCC_BDCR, RCC_BDCR_LSERDY, RCC_CR, RCC_CR2, RCC_CR2_HSI14RDY, RCC_CR2_HSI48RDY, RCC_CR_HSERDY, RCC_CR_HSIRDY, RCC_CR_PLLRDY, RCC_CSR, RCC_CSR_LSIRDY, RCC_HSE, RCC_HSI, RCC_HSI14, RCC_HSI48, RCC_LSE, RCC_LSI, and RCC_PLL. Re-enable the internal clock (high speed and low speed clocks only). The internal clock must be disabled (see rcc_osc_off) for this to have effect. The LSE clock is in the backup domain and cannot have bypass removed until the backup domain write protection has been removed (see pwr_disable_backup_domain_write_protect) or the backup domain has been reset (see rcc_backupdomain_reset). [in] osc Oscillator ID. Only HSE and LSE have effect. Definition at line 241 of file rcc_common_all.c. References RCC_BDCR, RCC_BDCR_LSEBYP, RCC_CR, RCC_CR_HSEBYP, RCC_CSR, RCC_HSE, and RCC_LSE. Enable an external clock to bypass the internal clock (high speed and low speed clocks only). The external clock must be enabled (see rcc_osc_on) and the internal clock must be disabled (see rcc_osc_off) for this to have effect. The LSE clock is in the backup domain and cannot be bypassed until the backup domain write protection has been removed (see pwr_disable_backup_domain_write_protect). Definition at line 211 of file rcc_common_all.c. RCC Turn off an Oscillator. Disable an oscillator and power off. An oscillator cannot be turned off if it is selected as the system clock. Definition at line 282 of file rcc.c. References RCC_BDCR, RCC_BDCR_LSEON, RCC_CR, RCC_CR2, RCC_CR2_HSI14ON, RCC_CR2_HSI48ON, RCC_CR_HSEON, RCC_CR_HSION, RCC_CSR, RCC_CSR_LSION, RCC_HSE, RCC_HSI, RCC_HSI14, RCC_HSI48, RCC_LSE, RCC_LSI, and RCC_PLL. RCC Turn on an Oscillator. Enable an oscillator and power on. Each oscillator requires an amount of time to settle to a usable state. Refer to datasheets for time delay information. 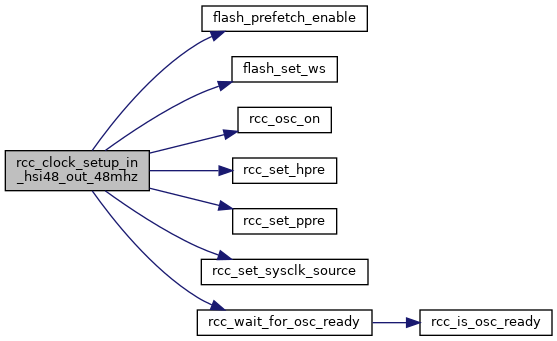 A status flag is available to indicate when the oscillator becomes ready (see rcc_osc_ready_int_flag and rcc_wait_for_osc_ready). Definition at line 244 of file rcc.c. References RCC_BDCR, RCC_BDCR_LSEON, RCC_CR, RCC_CR2, RCC_CR2_HSI14ON, RCC_CR2_HSI48ON, RCC_CR_HSEON, RCC_CR_HSION, RCC_CR_PLLON, RCC_CSR, RCC_CSR_LSION, RCC_HSE, RCC_HSI, RCC_HSI14, RCC_HSI48, RCC_LSE, RCC_LSI, and RCC_PLL. RCC Clear the Oscillator Ready Interrupt Flag. Clear the interrupt flag that was set when a clock oscillator became ready to use. Definition at line 57 of file rcc.c. References RCC_CIR, RCC_CIR_HSERDYC, RCC_CIR_HSI14RDYC, RCC_CIR_HSI48RDYC, RCC_CIR_HSIRDYC, RCC_CIR_LSERDYC, RCC_CIR_LSIRDYC, RCC_CIR_PLLRDYC, RCC_HSE, RCC_HSI, RCC_HSI14, RCC_HSI48, RCC_LSE, RCC_LSI, and RCC_PLL. RCC Disable the Oscillator Ready Interrupt. Definition at line 123 of file rcc.c. RCC Enable the Oscillator Ready Interrupt. Definition at line 90 of file rcc.c. References RCC_CIR, RCC_CIR_HSERDYIE, RCC_CIR_HSI14RDYIE, RCC_CIR_HSI48RDYIE, RCC_CIR_HSIRDYIE, RCC_CIR_LSERDYIE, RCC_CIR_LSIRDYIE, RCC_CIR_PLLRDYIE, RCC_HSE, RCC_HSI, RCC_HSI14, RCC_HSI48, RCC_LSE, RCC_LSI, and RCC_PLL. RCC Read the Oscillator Ready Interrupt Flag. Definition at line 157 of file rcc.c. References cm3_assert_not_reached, RCC_CIR, RCC_CIR_HSERDYF, RCC_CIR_HSI14RDYF, RCC_CIR_HSI48RDYF, RCC_CIR_HSIRDYF, RCC_CIR_LSERDYF, RCC_CIR_LSIRDYF, RCC_CIR_PLLRDYF, RCC_HSE, RCC_HSI, RCC_HSI14, RCC_HSI48, RCC_LSE, RCC_LSI, and RCC_PLL. Disable the clock on particular peripheral. Definition at line 135 of file rcc_common_all.c. Enable the clock on particular peripheral. Definition at line 121 of file rcc_common_all.c. Referenced by crs_autotrim_usb_enable(), and st_usbfs_v2_usbd_init(). Reset particular peripheral, and hold in reset state. Definition at line 166 of file rcc_common_all.c. Reset particular peripheral, and restore to working state. Definition at line 150 of file rcc_common_all.c. Referenced by can_reset(), i2c_reset(), and spi_reset(). Restore peripheral from reset state to working state. Definition at line 181 of file rcc_common_all.c. Remove the reset on particular peripherals. There are three registers involved, each one controlling reset of peripherals associated with the AHB, APB1 and APB2 respectively. Several peripherals could have the reset removed simultaneously only if they are controlled by the same register. Definition at line 103 of file rcc_common_all.c. Enable the clock on particular peripherals. There are three registers involved, each one controlling the enabling of clocks associated with the AHB, APB1 and APB2 respectively. Several peripherals could be disabled simultaneously only if they are controlled by the same register. [in] en Unsigned int32. Logical OR of all enables to be used for disabling. Definition at line 62 of file rcc_common_all.c. Enable the clock on particular peripherals. There are three registers involved, each one controlling the enabling of clocks associated with the AHB, APB1 and APB2 respectively. Several peripherals could be enabled simultaneously only if they are controlled by the same register. Definition at line 41 of file rcc_common_all.c. Reset particular peripherals. There are three registers involved, each one controlling reset of peripherals associated with the AHB, APB1 and APB2 respectively. Several peripherals could be reset simultaneously only if they are controlled by the same register. [in] reset Unsigned int32. Logical OR of all resets. Definition at line 82 of file rcc_common_all.c. RCC Set the AHB Prescale Factor. Definition at line 484 of file rcc.c. Definition at line 524 of file rcc.c. 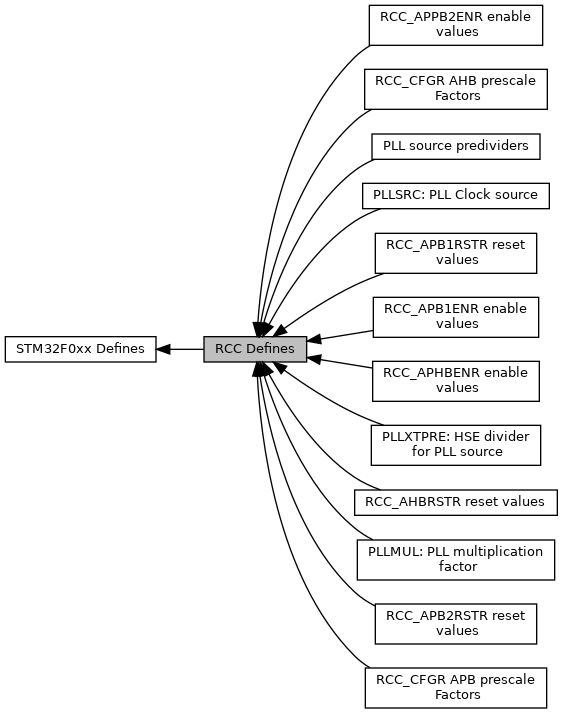 References I2C1, RCC_CFGR3, and RCC_CFGR3_I2C1SW. Definition at line 531 of file rcc.c. Definition at line 194 of file rcc_common_all.c. References RCC_CFGR, RCC_CFGR_MCO_MASK, and RCC_CFGR_MCO_SHIFT. RCC Set the PLL Multiplication Factor. This only has effect when the PLL is disabled. Definition at line 434 of file rcc.c. 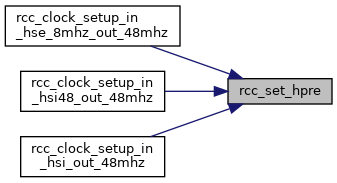 Referenced by rcc_clock_setup_in_hse_8mhz_out_48mhz(), and rcc_clock_setup_in_hsi_out_48mhz(). RCC Set the PLL Clock Source. Definition at line 447 of file rcc.c. RCC Set the HSE Frequency Divider used as PLL Clock Source. Definition at line 461 of file rcc.c. RCC Set the APB Prescale Factor. Definition at line 473 of file rcc.c. Set PLL Source pre-divider CAUTION. On F03x and F05, prediv only applies to HSE source. On others, this is after source selection. See also f3. Definition at line 495 of file rcc.c. RCC Set the Source for the RTC clock. [in] clock_source rcc_osc. RTC clock source. Only HSE/32, LSE and LSI. Definition at line 408 of file rcc.c. References RCC_BDCR, RCC_BDCR_RTCSEL, RCC_BDCR_RTCSEL_HSE, RCC_BDCR_RTCSEL_LSE, RCC_BDCR_RTCSEL_LSI, RCC_HSE, RCC_LSE, and RCC_LSI. RCC Set the Source for the System Clock. [in] osc enum ::osc_t. Oscillator ID. Only HSE, LSE and PLL have effect. Definition at line 334 of file rcc.c. References RCC_CFGR, RCC_CFGR_SW, RCC_CFGR_SW_HSE, RCC_CFGR_SW_HSI, RCC_CFGR_SW_HSI48, RCC_CFGR_SW_PLL, RCC_HSE, RCC_HSI, RCC_HSI14, RCC_HSI48, RCC_LSE, RCC_LSI, and RCC_PLL. RCC Set the Source for the USB Clock. [in] osc enum ::osc_t. Oscillator ID. Only HSI48 or PLL have effect. Definition at line 363 of file rcc.c. References RCC_CFGR3, RCC_CFGR3_USBSW, RCC_HSE, RCC_HSI, RCC_HSI14, RCC_HSI48, RCC_LSE, RCC_LSI, and RCC_PLL. RCC Get the System Clock Source. Definition at line 507 of file rcc.c. References cm3_assert_not_reached, RCC_CFGR, RCC_CFGR_SWS, RCC_CFGR_SWS_HSE, RCC_CFGR_SWS_HSI, RCC_CFGR_SWS_HSI48, RCC_CFGR_SWS_PLL, RCC_HSE, RCC_HSI, RCC_HSI48, and RCC_PLL. RCC Get the USB Clock Source. Definition at line 549 of file rcc.c. References RCC_CFGR3, RCC_CFGR3_USBSW, RCC_HSI48, and RCC_PLL. Block until the hardware indicates that the Oscillator is ready. Definition at line 227 of file rcc.c. Definition at line 45 of file rcc.c. Definition at line 46 of file rcc.c. Referenced by rcc_clock_setup_in_hse_8mhz_out_48mhz(), rcc_clock_setup_in_hsi48_out_48mhz(), rcc_clock_setup_in_hsi_out_48mhz(), and usart_set_baudrate().